Today I'm sharing quilts that I have made using my original folk art patterns. Free form folk art applique' is one of my greatest passions. Art originating among the common people of a nation or region and usually reflecting their traditional culture, especially everyday or festive items produced or decorated by unschooled artists. Here is one of my earliest folk art quilts. I made this to celebrate Hanna's 6th Birthday. In this one I used my grandmother's hanky. Here are two that I designed in a Gwen Marston workshop in 2012. I really need to stitch these up. I made all the patterns for Mothers Garden, finished in 2011. Here is my version of Susan's pineapple design. I'm not sure about that stem. Thank goodness coco protected it for me. What is it about laying on quilt pieces? Finally, here are the two Alice Payne blocks that I'm working on. I have decided to make a pattern for this quilt and will probably have it available in the Fall. What is it about our pets laying on our quilts....mine does the same exact thing! So funny! I'm inspired by all your folk art...fun post! I have really developed an appreciation for this style over the past few years. A folk art-style quilt is definitely in the queue - once I finish the eagles! Love your folk art quilts and can definitely see Gwen's influence. 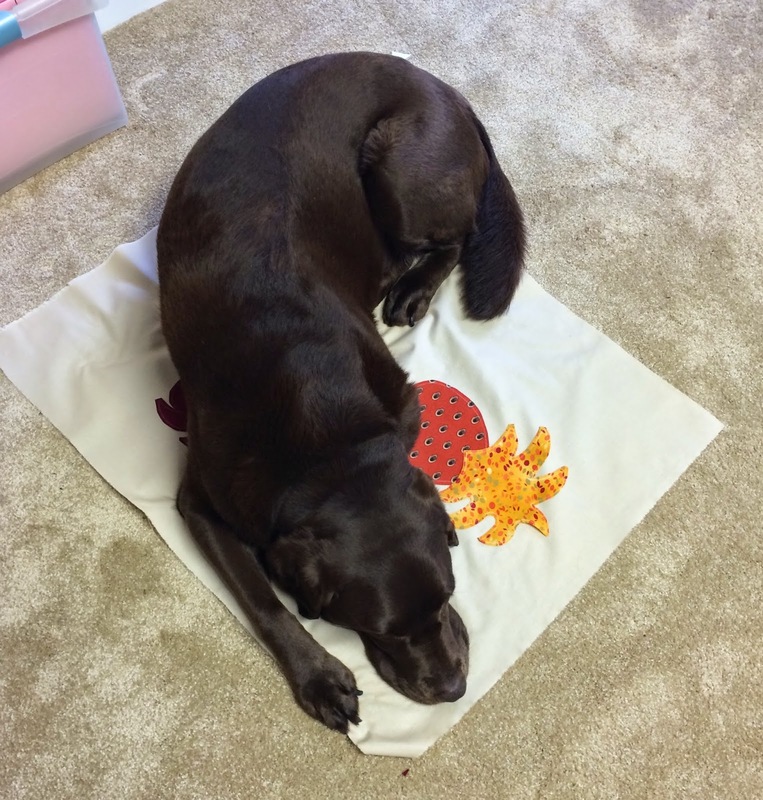 I'm so glad you are going to make a pattern for the Alice Payne quilt. I love it and hand appliqué is my favorite type of sewing so ill be anxiously waiting for it to appear in your shop. You have a definite flair for this, Barb. It is all so "you", and makes me smile. Mother's Garden is especially beautiful. Really like your Alice Payne blocks. The green fabric you are using is a delightful touch of movement. I love your Folk Art spirit and especially your Mothers Garden... I saw it on Pinterest and wow...what a beauty ! Your AP blocks are gorgeous...be sure that your quilt will be awesome ! Great little quilts! I especially love Hannah's! All beautiful, as always! 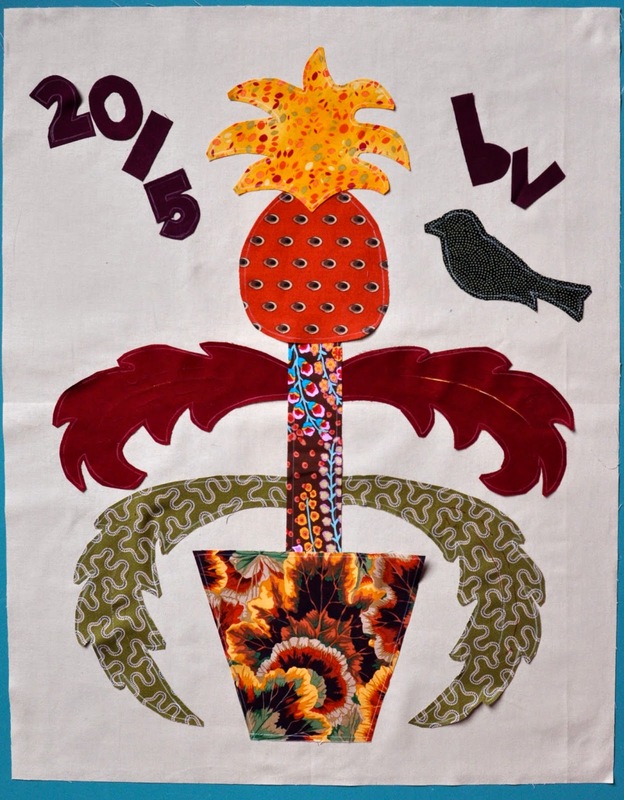 Thanks for sharing and for reminding us that our quilts can be such wonderful reflections of our true selves. I'm jumping up and down with joy that you're releasing a pattern for the AP quilt! All your work is so beautiful Barb, even the stem in your pineapple block. Yay for Coco making sure your pieces don't blow away. Love all your folky quilts. I have come to conclusion that my dog is just jealous. Anything to get some attention! Like he isn't spoiled! You are amazing! I love all your pieces but your early works are so inspiring. Wow! You have made so many and all are beautiful. I really love your designs. 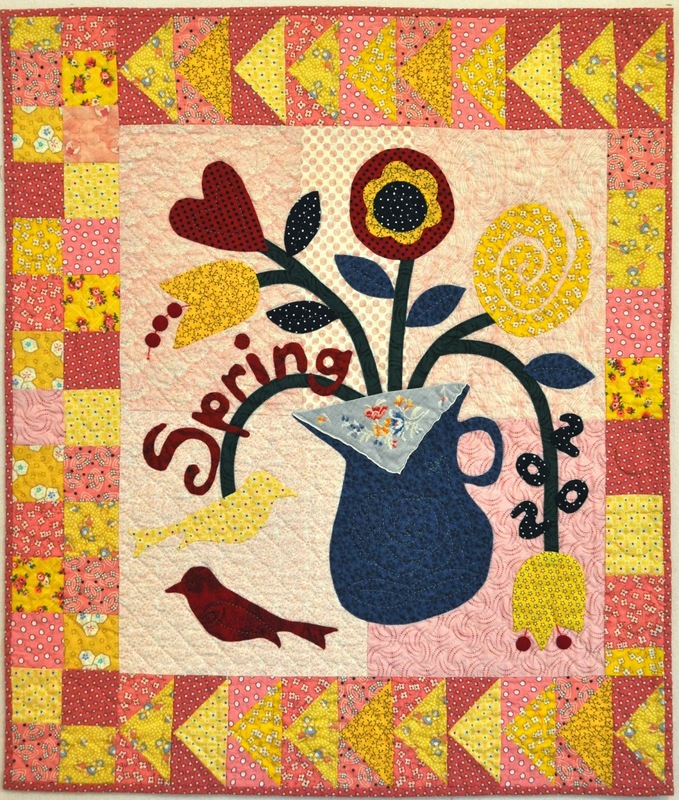 Especially in love with the Spring quilt with Grandma's hanky. GORGEOUS!! I love your folk art quilts! They are so fun, and so "you". I agree with MJ - I can see Gwen's influence in your work. She IS the master, isn't she? All of your work is beautiful, but the folk art touches my heart. I anxiously await the Alice Payne pattern! Love them all! I'm a big fan of free form folk art shapes. Cool on the Alice Payne patterns! Your style is delightful and charming and it reflects your personality. Thanks for s wonderful show today. Wahoo! I love, love all of these. I got to take Gwen's appliqué workshop a few years ago. You've really taken her teachings and given them your own happy, warm style. It's so great that you're continuing to teach this folk art to others. I'm going to go buy your pattern set right now! I am so happy to see all of your quilts here today. They are the kind that put smile on a face! These are such fun! I love the fabrics in the hanky quilt and the spiral flower. And I love Coco's quilt. Does he like it? Beautiful Barb! I love your folk art quilts -- they're all so interesting! LOVE these quilts! I really need to do this sometime. I can never get enough of your Mothers Garden. Fabulous quilts, Barb. Love your folk art patterns. Nicely done....these are so inspiring! What a great post! I wish more people would show their past work from time to time. It gets us all motivated. I just love your folk art designs and your Mothers Garden quilts is one of my all time favorites. Thanks for sharing. Folky appliqué is so much fun, right? Your work, as always, is a delight! I've enjoyed catching up with you. Good luck on your etsy endeavors - I'm headed there for a peek now. 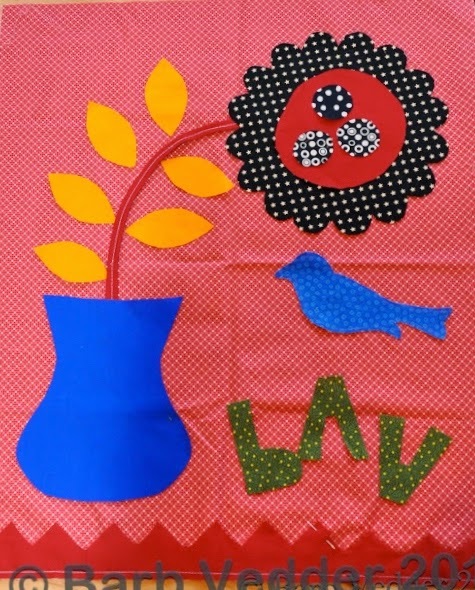 Love all your quilts - just ordered your folk art applique patterns - can't wait to see them in person! Love all your folky quilts and can't wait for the Alice Payne pattern!